GRADER Ruggedly built of steel. Steers by handle in front of driver’s seat. Two levers adjust scraper blade. Over-size rubber tires are deep-grooved for traction. I found this on the shelf of a Dayton, OH area thrift store. Even though it is a Mini, it is not a Mini in the sense of modern mini-Tonkas. This one measures about a foot in length. 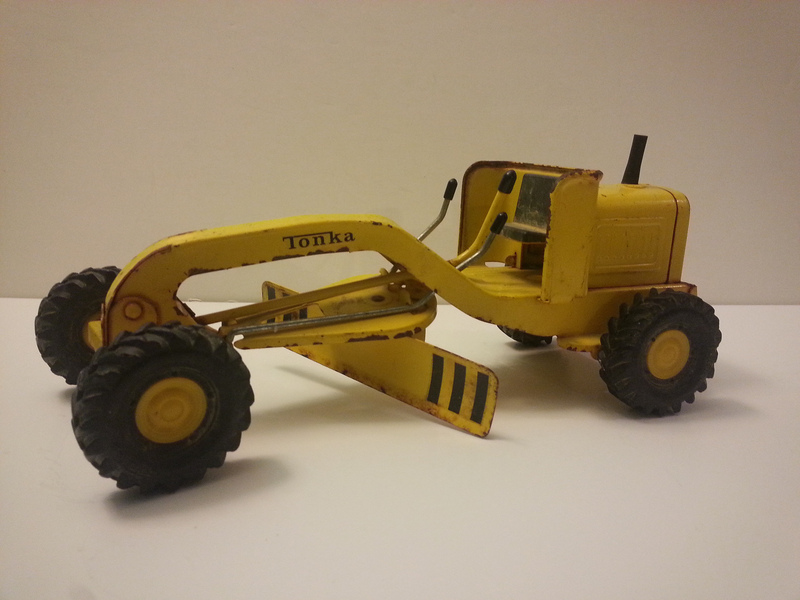 In my experience, unless a Tonka is extremely rare or in NIB (New in Box) condition, it’s value is relatively low. I have seen NIB like this one listed for $70-$100 (although I am not certain they sold for that amount), but one in ‘played with’ condition and slightly rusty like mine, is worth $15-$25.